A mayor change of the quality standards of the automotive industry according IATF 16949:2016 is the companies have to make sure, products, which are not fulfilling their requirements, have to be made unusable, bevor disposing. This we could do and we are already doing this with our two-shaft shredders. For this case we developed very strong cutters with a special cutter design, which cut the material in rough parts, so it is unusable afterwards. We have different rotor shears in our scope of delivery, depending on requested throughput capacity and material input size. For a throughput capacity of 500 kg/h we use for type DS4 with a cutting device of 650 x 540 mm. 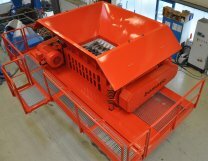 For large parts, with length up to 1.500 mm our two-shaft shredder bomatic B1700 is available, driven with 2×55 kW. Do you also have to shred your parts? We are looking forward to do a test run for you in our test shop. 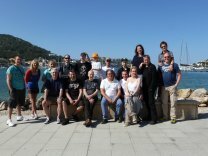 Please contact our Mrs. Böttcher, 0049-4106-7672-31 or boettcher@bomatic.de and benefit from our experience in this area. 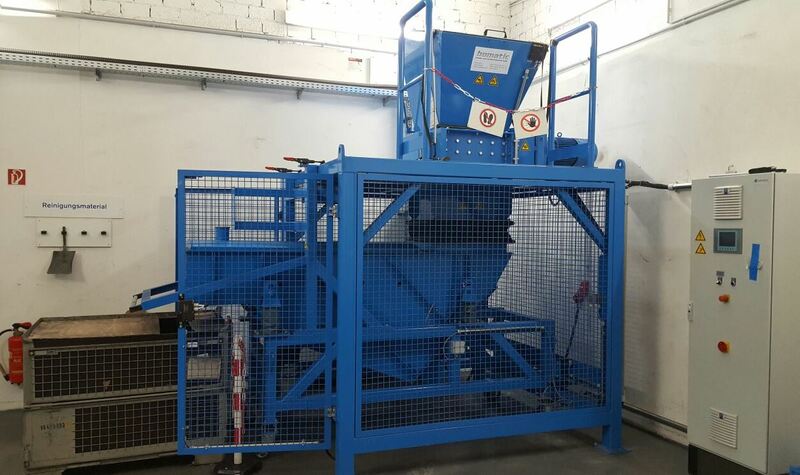 After introduction of our Rotacrex R1200 in 2010 and the smaller type R750 in 2013 is now our biggest vertical shredder Rotacrex R1600 available. The machine was built on customer’s demand and is being tested in the moment. With an impact chamber diameter of 1.600 mm the machine looks much bigger than expected. The machine weights about 9 t and is built extremely strong and solid. Installed power is 160 kW, driven with frequency converter. As at the existing two shaft shredders and Granulators it was very important to make the service of the machine as easy as possible. Wearing parts are easy to reach and all inner parts are easy to change as they are screwed from the outside of the machine. 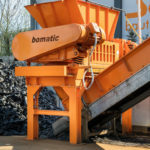 Once more bomatic received an enquiry for a special two-shaft shredder: The task was to shred extremely tough material with a requested throughput capacity of 5 t/h. In order to get the high torque we reduced the length of our machine type B1600 from 1.600 mm down to 1.300mm and increased the drive from 2 x 75 kW up to 2 x 90 kW. With these drives is this machine our strongest two-shaft shredder in this line and it is running and is running to our customer’s full satisfaction. Blue clearly visible, surrounded by black steel construction and black belt conveyors…. 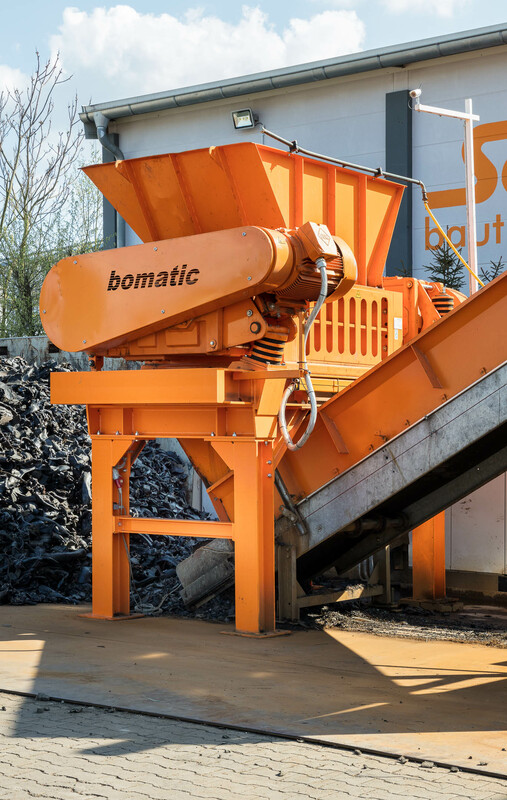 Since recently the first bomatic rotor shear type bomatic B1200DD is running in Finland and is used for shredding of bio waste or food waste. 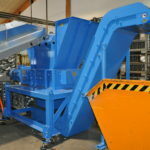 Our two shaft shredder is pre shredding the bio waste for a big biogas plant. After the shredding the material is fed to a drum sieve, where the material is prepared for further processing. With a cutting module opening of 1.200 x 750 mm and driving power of 2 x 22 kW the customer was convinced by our bomatic B1200DD. 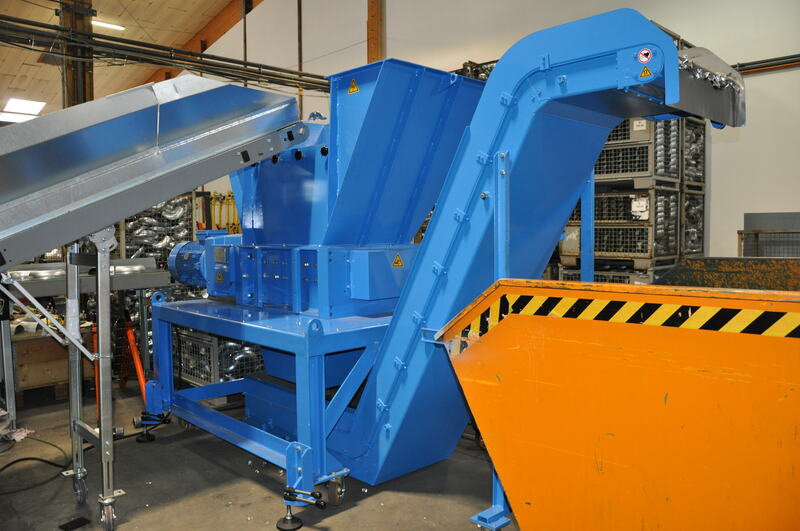 Designed for a throughput capacity of 8-10 t/h the machine is shredding the finish bio waste reliably. Do you know the new video about our vertical shredder type Rotacrex R1200 for micro-shredding of difficult substrates for biogas plants? you are able to watch the function and the performance of our Rotacrex R1200 impressively. This video was created from our partner PlanET Biogastechnik GmbH, they are integrating our vertical shredder for more than three years in their biogas plants successfully. Difficult substrates such as grass, straw or manure is shredded efficiently for optimum gas release, which as a result provides a higher gas yield. It is possible to integrate low cost raw materials in the substrate mix without compromising the gas yield. More information you could find on the homepage of PlanET Biogastechnik GmbH under http://www.planet-biogas.co.uk/planet-rotacrex-750/ or you contact our Mrs. Böttcher under 0049-4106-7672-31 directly. 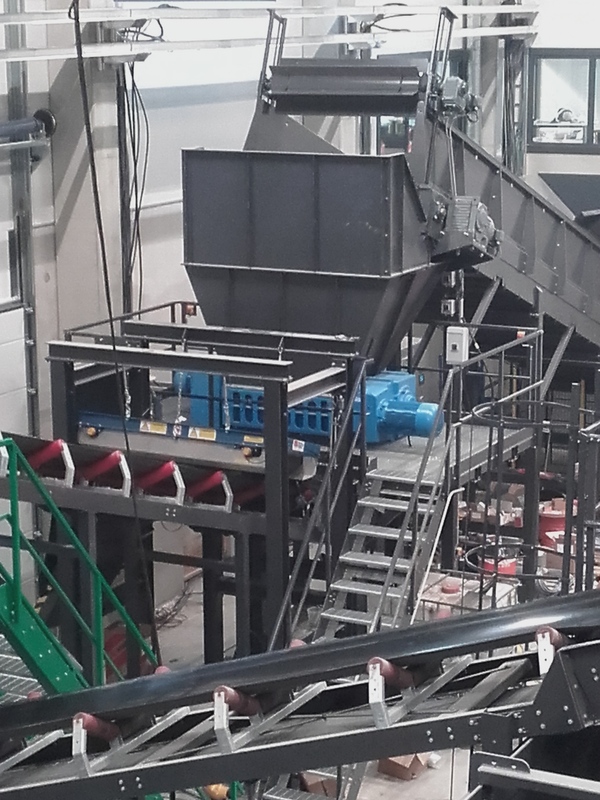 Since beginning of this months old activated carbon filters are being shredded at Dräger Services in Lübeck with our two shaft shredder type bomatic B600V. After the shredding process the carbon powder is being separated by a vibration screen. The task here was that either activated carbon filters have to be shredded or also not dusty products, where the separation with a sieve is not necessary. 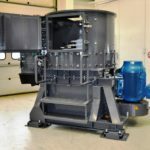 Therefore a moveable vibration sieve was constructed, which is moved under the shredding machine and connected to the dust suction system when shredding the filters. So the filters could be shredded without problems and the carbon powder is being separated very cleanly. After several test runs and a detailed planning process the plant was installed and started up within two days, so after a very short time the first filters could be shredded. We would like to thank Dräger Interservices for the extremely good partnership and are looking forward to further, new projects hopefully. Complete sofas – no problem for our rotary shear type bomatic B1600, which just got a test run here in Ellerau before delivery to customer site. Also truck tires are no task for the 21,5 t machine, the tires are being caught by the 80 mm cutters and cut into pieces. This is possible by a driving power of 2 x 75 kW and a working torque of about 45.000 Nm per drive. As working space are needed 6x4 m, height about 5 m.
All our heavy two-shaft shredders are equipped with divided bearing plates. For changing of cutters it is possible to change the cutter shafts completely, therefore the cutter change could be done in a short period of time. 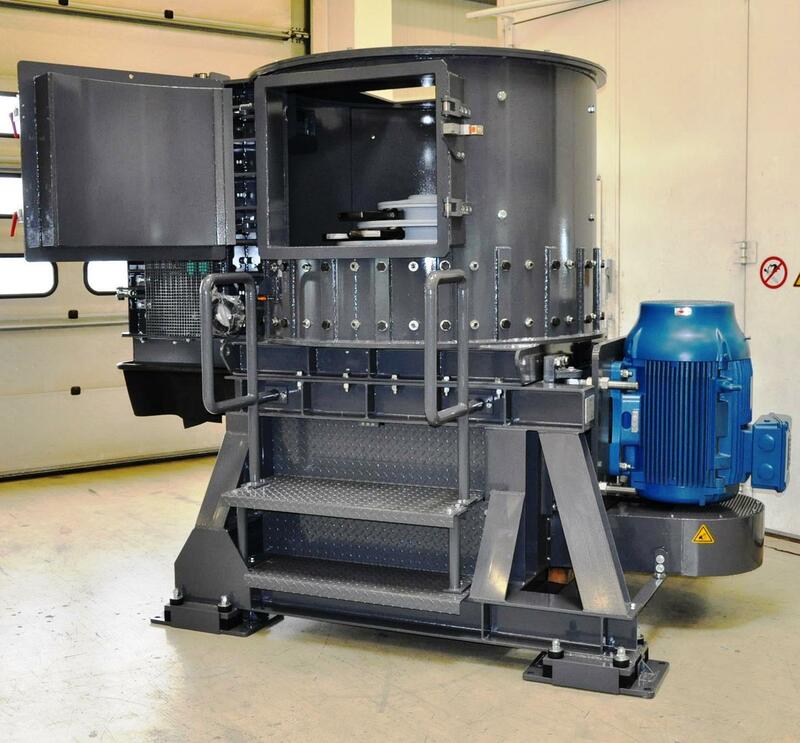 The shredder of the month february is our 4-shaft-shredder type bomatic 4WV, which is being used for shredding of hard discs and other data mediums at the company MAMMUT Dokumentenservice GmbH & Co. KG in Ahrensburg successfully. By using 4-shaft technology it is possible to build in a screen under the slow running cutter shafts and obtaining a defined particle size. 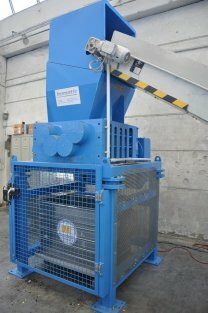 The machine is built in a very strong version, in order to shred the quite stabile hard discs. This stability convinced in the end the customer to purchase the machine. Some technical details: The machine is driven by 22 kW electric drive, cutter module opening is 590 x 575 mm. Build in a maintenance friendly version as the cutter shafts are changeable completely in one piece. The cutter shafts themselves are equipped with single, involute toothed cutters with cutter width of 18 mm. Under the cutter shafts is placed a screen with 20 mm holes, which is possible to swivel downwards for maintenance reason. 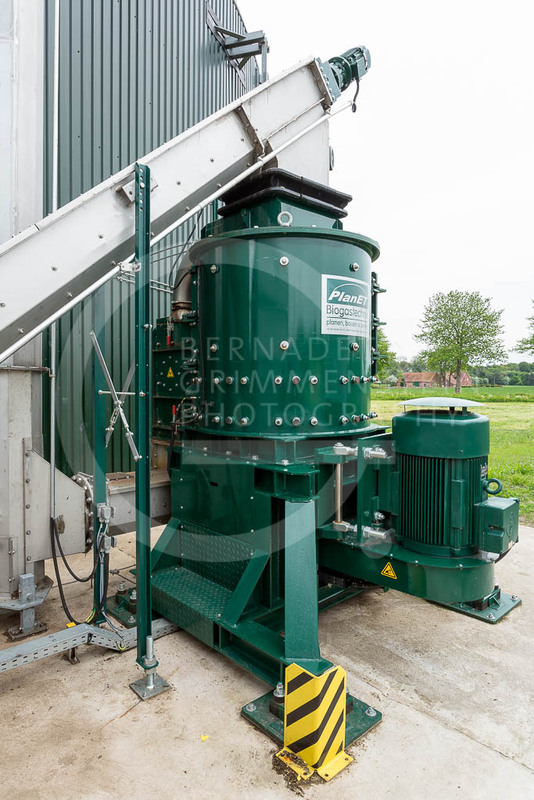 With this machine the bomatic delivery program is complete now: Beginning with the small single-shaft shredder Monocrex, the two-shaft shredder bomatic, the 4-shaft shredder 4WV, Granulator Unicrex up to the Vertical shredder Rotacrex; surely we have the right shredder for your need in our delivery program!